This policy ensures that everyone receives proper recognition and makes the process easier and smoother for both parties. Free local pick up available. Check to see if this part is compatible with your system before purchasing. Serial Number: SONFJ1TP200936. 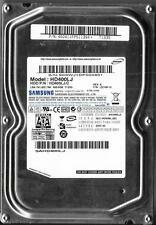 SAMSUNG HD403LJ 400GB 7200RPM 3.5" HARD DRIVE. Rotation Speed SAT Standard USB/ATA. Storage Capacity: 400GB. interface SATA. All the logos used are propriety to their respective owners and Technology Traderz does not have any authority over them. We are equipped with the best technical staff that is professionally trained and remarkably compatible to your needs. IT-Recoup Ltd. Chanhassen, MN. We will attempt to resolve things in the quickest and least disruptive way possible. SAMSUNG SPINPOINT HD400LJ 400GB SATA HARD DRIVE TESTED AND FORMATTED. THE DRIVE WAS TESTED AND FORMATTED. Samsung 3.5" 400Gb SATA hard disk drive. Drive has been tested and wiped, all sectors are good and accessible. SMART is good. SAMSUNG HD400LD 400GB IDE PCB BOARD ONLY. MODEL: HD400LD. CAPACITY: 400GB. INTERFACE: IDE. PCB CIRCUIT BOARD ONLY. Stress tested using HDSeninel random seek test. -- Drive has been professionally securely wiped using DOD format --. Form Factor. SATA II (3.0 Gbp/s). SAMSUNG HD400LJ 400GB SATA PCB BOARD ONLY. MODEL: HD400LJ. CAPACITY: 400GB. PCB CIRCUIT BOARD ONLY. PCB BOARD: BF41-00107A. INTERFACE: SATA. SAMSUNG SpinPoint T Series HD400LJ 400GB 7200 RPM 8MB Cache SATA 3.0Gb/s 3.5" Hard Drive Bare Drive. SpinPoint T Series. Multi Sinusoidal Seek(MSS) algorithm. Bowl type architecture. SMART Command Transport(SCT) feature. Model: HD403LJ. P/N: 40A41QSZ200300. 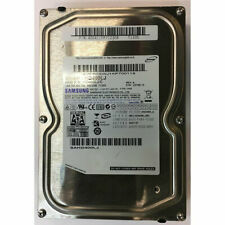 This is a used, Samsung Spinpoint 400GB SATA Hard Drive , tested and in great working condition. HDD P/N: HD403LJ/DOM. all original parts and accessories. Parts are not to be removed or swapped. Drobo B1200i Drive Kit - Qty 2 Samsung SSD's & Cradles. Drobo B1200i Drive Kit. Drobo Tiered Data Drive Kit. Box of 2 SSD Drives & Cradles 480GB X 2 (960GB Total Capacity). Qty 2 Samsung MZ-7KM480NE 480GB SSD Drive's. MDL: HM400LI. HDD P/N: HM400LI. P/N: 307411CQ928545. Samsung 400Gb SATA Notebook Hard Drive. all original parts and accessories. Parts are not to be removed or swapped. We scan all bar-codes on hard drives and PCB's for our records. HDD Part Number:HM400LI. If you aren't sure if this is a compatible hard drive part, see ourMatching Guide. hddSupplier carries about every part necessary for data recovery and hard drive repair projects. HDD Part Number:HD400LJ. If you aren't sure if this is a compatible hard drive part, see ourMatching Guide. hddSupplier carries about every part necessary for data recovery and hard drive repair projects. HDD Part Number:HD403LJ. If you aren't sure if this is a compatible hard drive part, see ourMatching Guide. hddSupplier carries about every part necessary for data recovery and hard drive repair projects. Model HM400HJ. Other part numbers 33851F14AAVU8B. Product Code 9395. Connections SATA. Size 400 GB. Speed 5400. Make SAMSUNG Notebook Disk Drive. WIN7 PRO DELL 760 BUNDLE CORE 2 DUO 2.8GHZ GEN 1 4.0GB 250GB 9248. Samsung SpinPoint 400GB Hard Drive . 3 month warranty. Passed full diagnostics, no bad sectors. 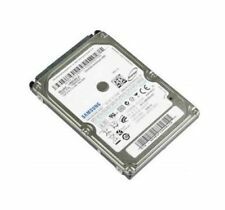 Samsung Hdd 400gb. Condition is Used. Dispatched with Royal Mail 2nd Class. P/N: 400311FP133455. Used but good working order 400GB SATA Samsung HD400LJ No bad sectors. Samsung Model: HD400LJ. PCB Sticker: PGSGB122B82633. PCB No: BF41-00107A TRIDENT REV.08. I received this hard drive with a NAS drive I bought a couple of years ago, looks in prestine condition. Sold AS IS with no other parts or accessories. Samsung HD400LJ [A]. Form Factor3.5" (25.4mm High). Rotation Speed7200rpm. Capacity: 400GB. rotation speed: 7200RPM. product family:Spin Point P133 SATA. manufacturer: Samsung. cache: 8MB. Hi here I have: Samsung hard drive 400gb, has been formatted. SAMSUNG HARD DRIVE. How long will it take to be sent We will do everything we can to sort it out!